I just spotted these polaroids of Lara & Michael on tending to it. Britt (whose own spectacular desert wedding was recently featured on a desert fete) designed the flora, and Sarah Yates shot the polaroids with her 600 SE. 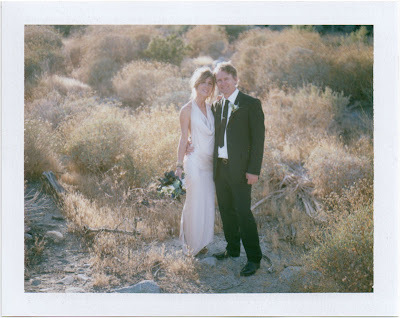 Hey Sarah, I love the idea of an entire wedding shot on instant film. The polis from our wedding are my very very favorites. If I had to choose, I'd chuck all the rest in order to keep the polaroids. No contest. Oh my dear sweet baby jesus, that dress. Yeah. I feel about the same about our polaroids. I'd prefer not to chuck the rest, as they are awesome. But if the house was on fire, I'd take the physical objects that our friends took. how effing hot is she in that dress? best part- one of the FUNNIEST (like no holds raunchy funny) women I ever met. They were all in the pool within 5 minutes of the party starting (her first), I hear. oh my jeebus. please tell me where she found that dress. I am saving these photos as inspiration for "bridal hair." I mean, MAN, that's some pretty hair. And the dress? DAMN. NEAR. PERFECT. I see these pictures and all my brain can process is "DRESS, DRESS, DRESS, DRESS, DRESS." Hot damn! Mewants. that's probably the hottest dress i've seen in a while. beautiful wedding. LOVE the polaroids.